An excellent starter feeder for a beginner. Ideally to be used indoors or undercover as the lid will not protect the food from the elements, but will stop the hens from getting in the top. The anti scratch guard will help prevent the hens from making to much mess with their feed. 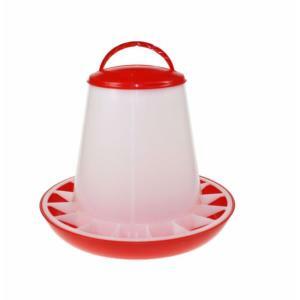 If you require an outdoor feeder then we would suggest trying an Ascot Feeder 3kg. Please ensure that feeders are suitable for the amount of chicks you have.